Red-brick house is rare in Jioufen. 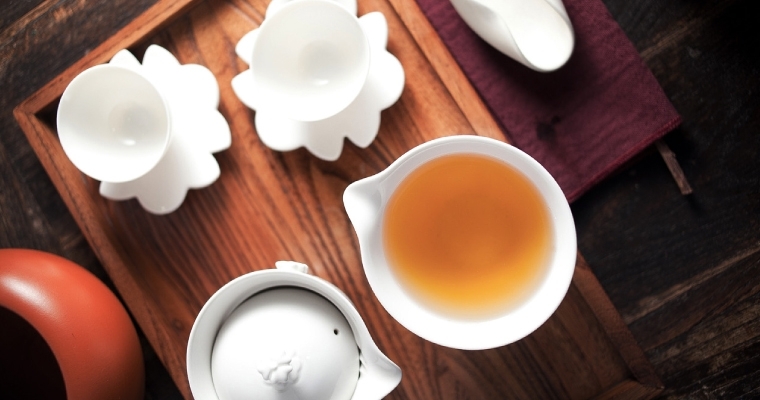 Experience the tea ceremony in the Hung's way. In this sky city, change is in constant. of mountain and sky help to clean out all the blue feelings and give new sensual enjoyment. In this rarely to see red brick in Jioufen, structure is known to be very unique and selected by the New Taipei City Government as the "model building." It was originally the private creation space of Hung Chih-Sheng and later was open to be the tea, pottery, and painting life gallery where visitors are able to have the new sensual enjoyment of tea drinking and the scenery of mountain and ocean. On each floor, oil paintings created and collected by the owner are displayed. The various tea instrument and ceramic works in display presents fully the passion of the owner toward "tea, pottery, and painting" and with experience sharing, visitors to the teahouse are able to have the interaction and exchanges of sense and sensibility. If you have the chance to visit Jioufen, you are more than welcome to come here to enjoy the sensual treats. The Sky City on Chingbian Rd. To enjoy the day off, visitors can come here to overlook Shenauo Bay, Batouzi Penisula, Bisha Fishing Port, Peace Island, Keelung Harbor, Yehliou Penisula, and Tiaoshi Coast of Qinshan. The mountain breeze and sea fog in the day time, sunset, and street light at the night time gives you the various views of scenery of the coastal line of Northern Taiwan. Here gives you the best view of this mountain city. Golden flower lamps in the fog.